This Technics SL-L20 recently came in for repair. The L20 remained, until now remained one of the the only two Technics models I have yet to see in person. 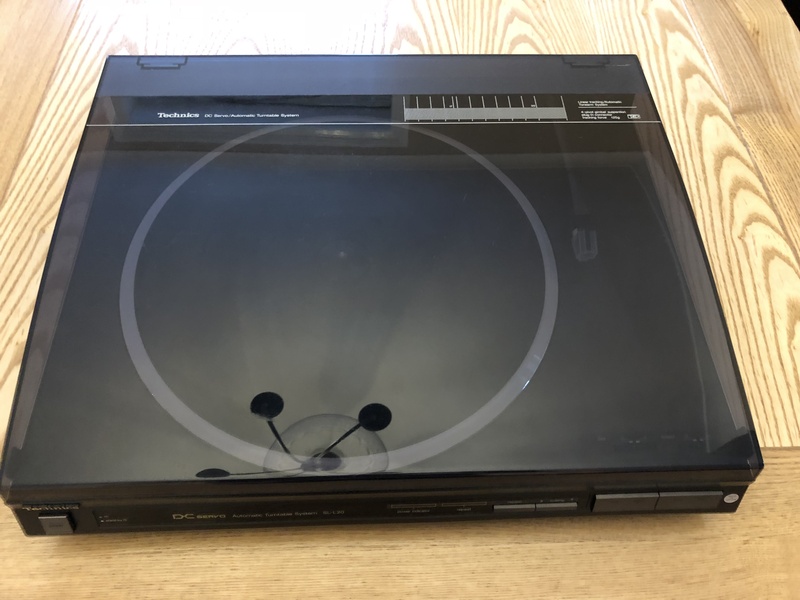 I’ve owned, serviced and / or repaired at least one example of every Technics model sold in the UK, besides the SL-M3 linear tracker which was one of the later linear models and fetch mega bucks on the second-hand market. 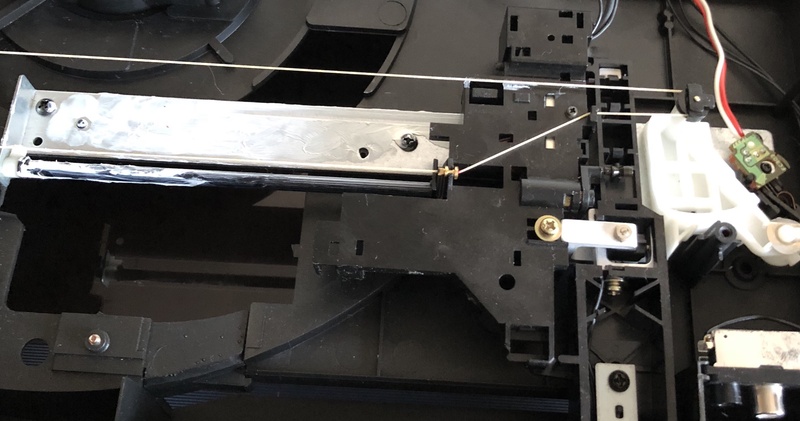 The SL-L20 is the complete opposite; a cheap and lightweight linear tracker with a mechanism that differs from that of most Technics linear turntables in that the arm and its mechanics are mounted to the turntable plinth and not a part of the lid. Cheap and pretty plasticky it may be, but it’s still capable of respectable performance with a bit of TLC. I delved straight in to carry out the usual preventative maintenance necessary for all linear tracking turntables of this age. The SL-L20 is particularly easy to service as everything is accessed through the underside. The linear tracking mechanism is inverted, allowing the arm to sit above the plinth and slide along a guide rail beneath. Otherwise it isn’t far removed from other Technics designs and as such suffers the usual problem of dried lubrication hindering movement. The grease was unusually difficult to remove, particularly from the bottom rail and drive cog. The little drive belt was in great condition and wasn’t replaced, though the mechanism did receive a thorough clean and the motor had a few drops of a light motor oil applied for good measure. This ‘table was reported to have issues with unsteady and incorrect speed. This issue is commonly caused by dirt and oxidisation affecting the speed control pots, marked VR101 and VR102 on the main circuit board. They were sprayed with a contact cleaner, and later adjusted through the two holes in the bass which allow them to be accessed with the deck assembled. The speed and size switches too were cleaned, necessitating removal of the board. I didn’t photograph the top of the board as to do so would have required desoldering the cables. 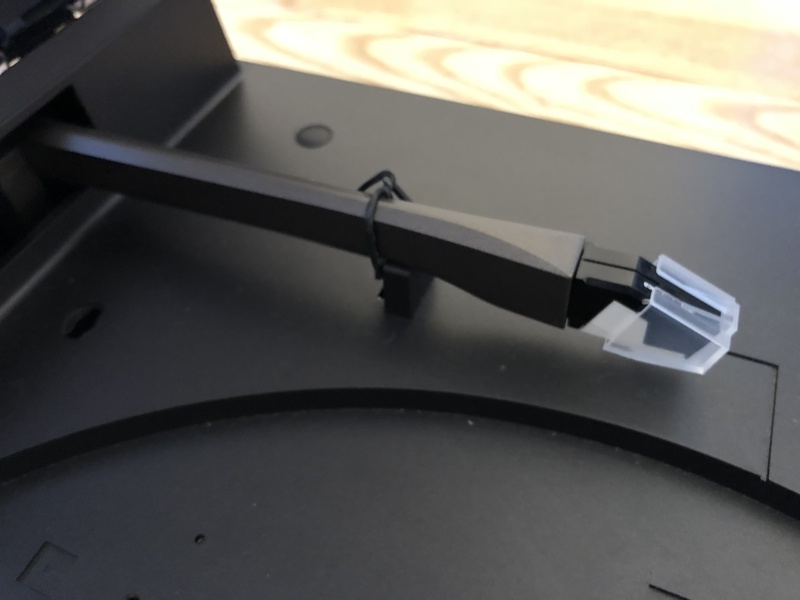 Other Technics ‘tables use plug-in connectors which make the job easier, but cost-cutting didn’t allow for that here. 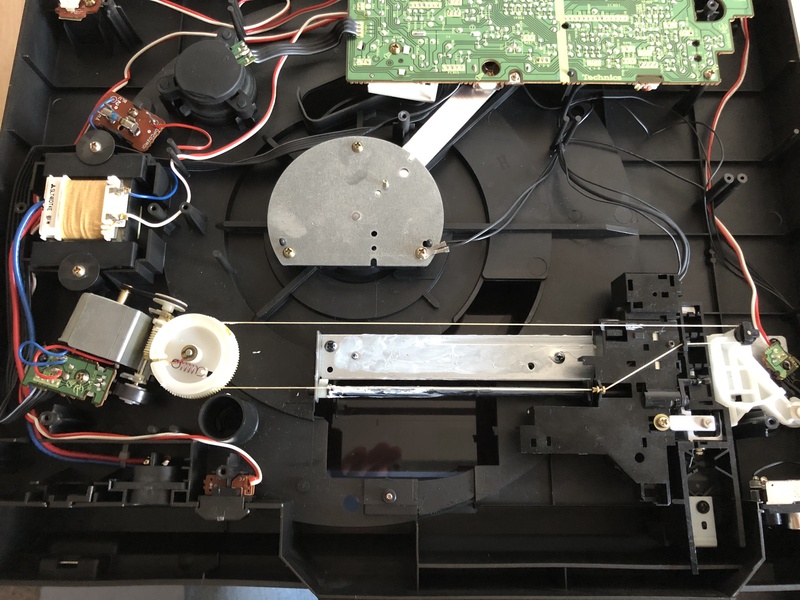 Removing the board isn’t terribly difficult, though you must take care during reassembly to carefully align the switches as the switches themselves are fragile and very easily broken. Other electronic adjustments were spot on, and the arm tracked straight so I left them well alone. The next phase of service was the main bearing, which was the most unusual part of this design. 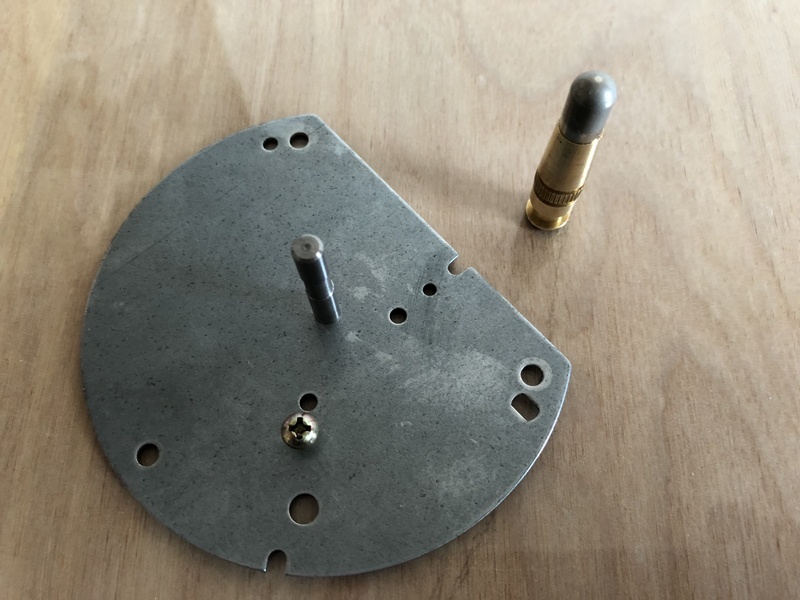 The bearing plate is removed, including the ground and heat transfer plate which attaches to the main circuit board. The bearing and spindle are removed as one assembly, and the aforementioned bracket removed to allow the spindle to be lifted from the baring. I thoroughly cleaned both the spindle and shaft with alcohol before the bearing was reassembled with five drops of oil. The result is a smooth and silent bearing, and a noticeable drop in record surface noise during testing. Final assembly involved a quick internal clean and a few drops of oil for the platter drive motor. This is a belt drive design with a small DC motor designed to be permanently lubricated, and thus difficult to disassemble for maintenance. Dropping a few drops of oil down the shaft was sufficient and reduced motor noise significantly. 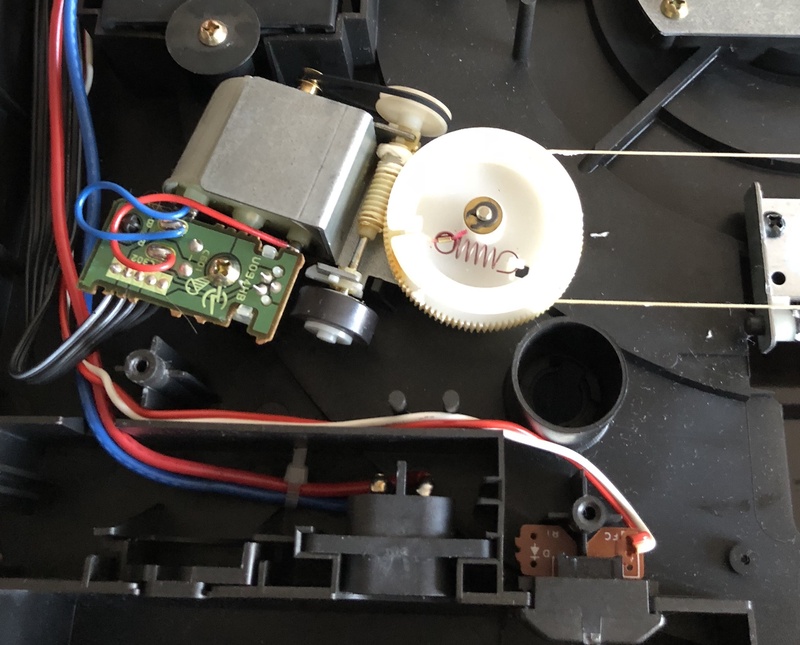 The motors are not completely silent, which will be particularly noticeable to anyone familiar with a Direct Drive technics which are inaudible. The motor sounds healthy and holds speed, and the drive belt looks to be a recent replacement. The platter and motor pulleys were cleaned for optimal performance. Final cleanup complete, the original P30 cartridge was replaced with an Audio-Technica AT-311EP. Aftermarket styli for the P30 are readily available in .7 mil conical and .3 x .7 mil elliptical form, as well as some more exotic shapes, but the cartridge was sounding rather scratchy with a known good stylus and I have seen these cartridges fail in the past. 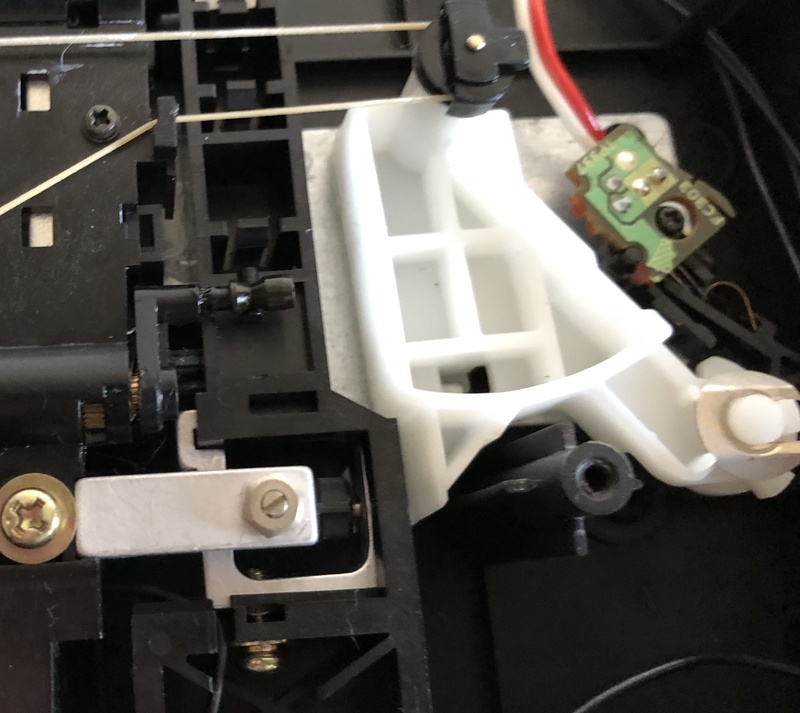 It is important to note that some aftermarket styli for P Mount cartridges require that the tracking force be adjusted, which isn’t always easy particularly on these linear decks. This deck isn’t laden with extravagant functions; a disc repeat function is about as advanced as it gets. Even speed and size are manual though there’s no provision for playing a 10” record automatically, and there is no mechanism to prevent you accidentally playing the mat and causing instantaneous stylus destruction if you forget to set the record size when playing a 7” disc. 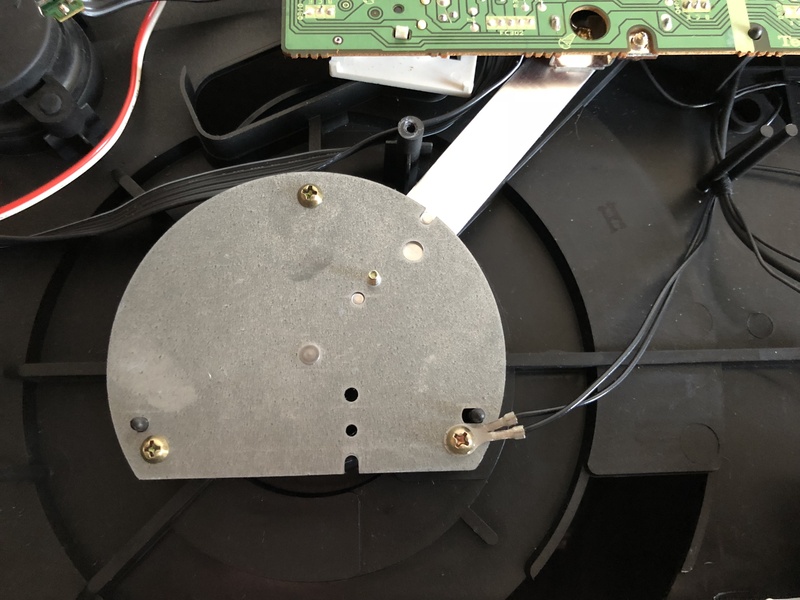 The deck will stop if there is no record on the platter by means of a lever beneath the platter which is attached to a momentary contact switch. A device on the platter is engaged when a record is present and when a record is in place will miss the lever beneath. 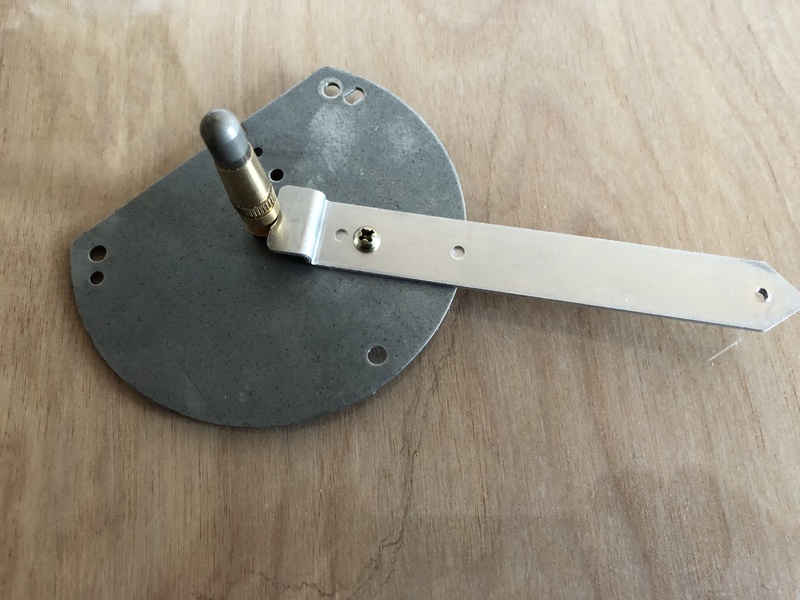 When no record is in place, the platter will trigger the lever and stop the turntable before the arm has time to move into position. 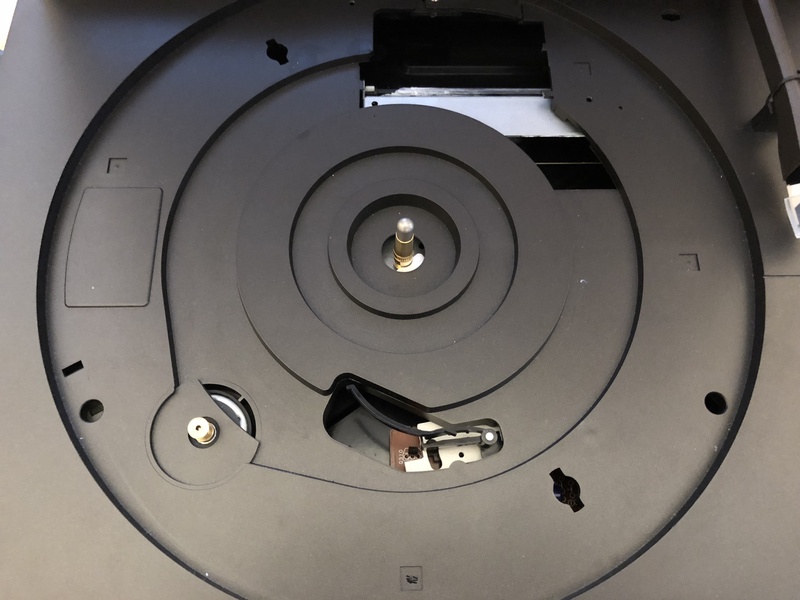 It’s a primitive if not clever system but requires that the original mat be used and correctly aligned such that the lever can protrude through a small slit in its surface. Cuing is electronic, though the arm drop speed is sharper than I’d ordinarily like. The arm lift damper was serviced, but it has limited travel which doesn’t allow for a slow descent. The arm is largely plastic with an effective length of 105 mm and fixed vertical tracking force of 1.25 grams, assuming a 6 gram cartridge is used. It takes a T4P plug-in P Mount cartridge, with a P30CS installed as standard and the stock EPS-P30CS 0.7 mil conical stylus. This deck wasn’t Technics’ finest hour. It’s their lowest end drive mechanism coupled to their cheapest linear arm. If you want a true taste of what a Technics can do, you’re better off finding one of their many direct drive models. But if you dig the conveniences and just want to spin a few records, the L20 sounds quite respectable and is very simple in its design, with little to go wrong given a bit of preventative maintenance. 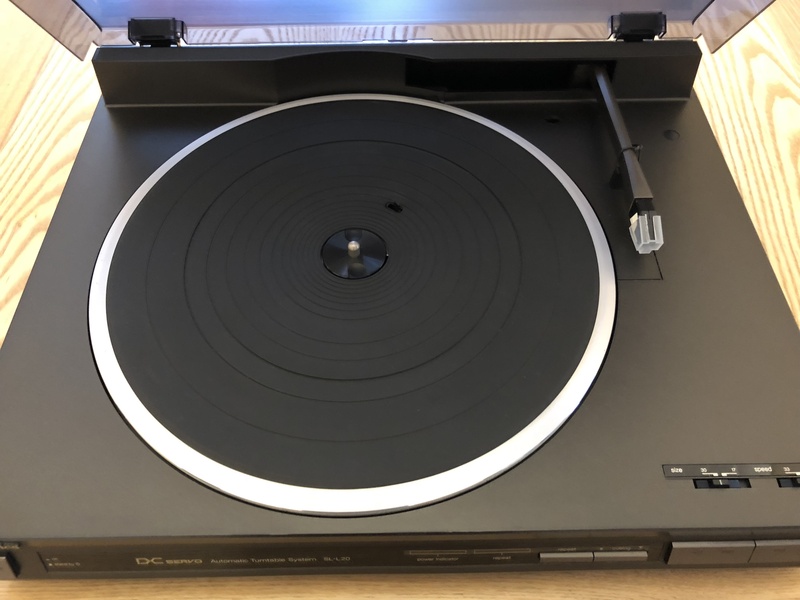 I’ve yet to come across a Technics that didn’t at least sound good, and I had great fun spinning 7” singles on the L20 before returning it to its rightful owner ready to deliver another few decades of faithful service. Replaced my cartridge on my SL-L20 and not getting any sound from turntable. All other components work and produce sound. Everything is lugged into correct location. Is there anything internal that would prevent sound? No, there isn’t. What cartridge did you use, I presume it is firmly seated in the socket with the retaining screw in place? Which cartridge did you install? I replaced it with a audio Technica AT85EP for the P mount turntables. Went firmly in place and the screw was inserted back in. Very strange issue. Did the turntable work before and does it work if you reinstall the original cartridge? 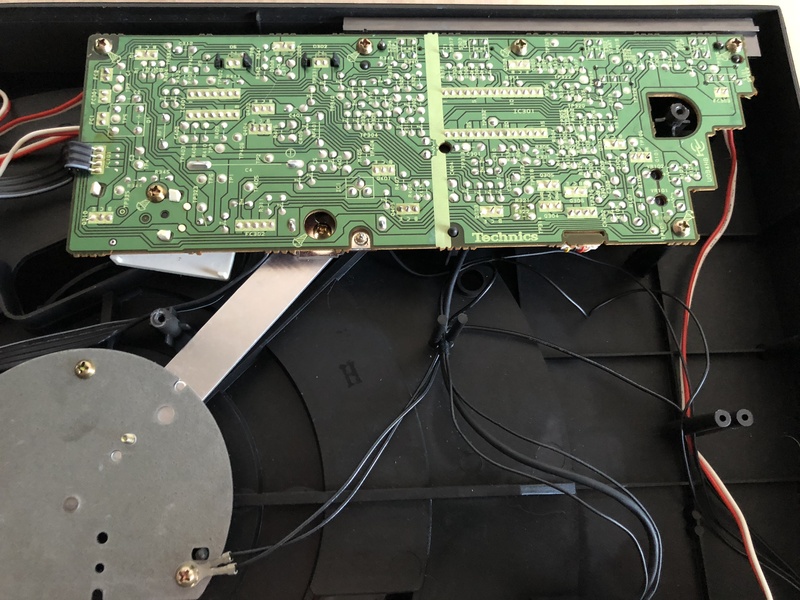 You either have a defective cartridge or something wrong with the turntable, though I can’t think what would cause that besides perhaps faulty wiring. As far as I recall the L20 doesn’t have a muting circuit. I presume you have the turntable wired into a moving magnet phono input on the amp or an external phono stage. Very strange. assuming the phono stage in your amp is working, I don’t see why the turntable wouldn’t be. Thanks for the excellent write up on the L-20. I purchased one of these some 20 years ago and it did perform well. However it has since been replaced by an SL-QL1 and DL1 which without question perform at a much different level! Definitely worth resurrecting and a great idea for usage. The QL-1 in particular is one of the best linear decks Technics made, I personally prefer them to the SL-7 / SL-10 / SL-15 which are generally considered the best of their range. 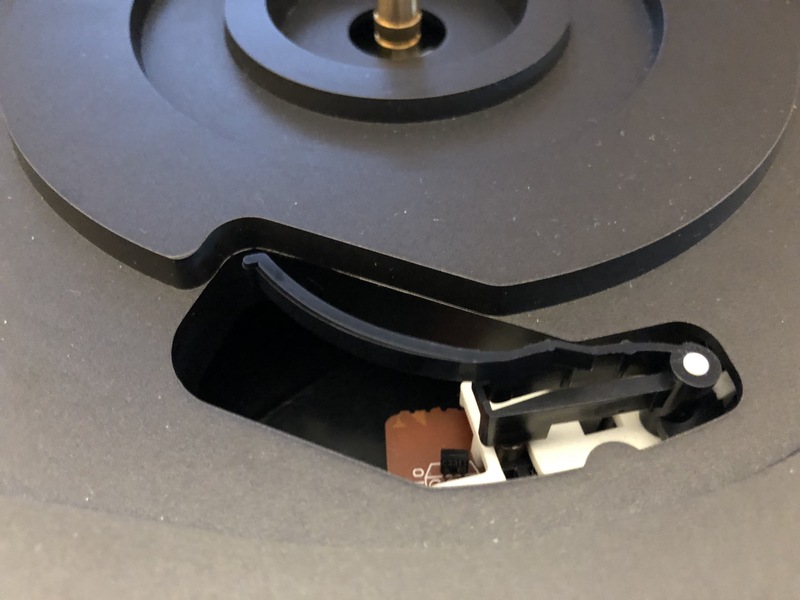 If yours has a good cartridge body the P30ES / P33ES is the correct elliptical stylus replacement and will get the best from the deck for very little money. You can find the full service manual Here which details the disassembly and adjustment procedures, for which you will need a DC voltmeter.